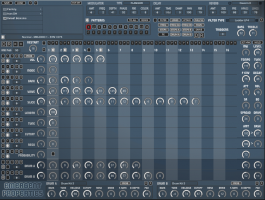 Emergent Properties for Kontakt 5 by Homegrown Sounds is Soundware (e.g. samples or presets that load into other products). Emergent Properties is an Advanced Wave Sequencer which has a main Melodic sequencer plus 2 additional Drum sequencers. 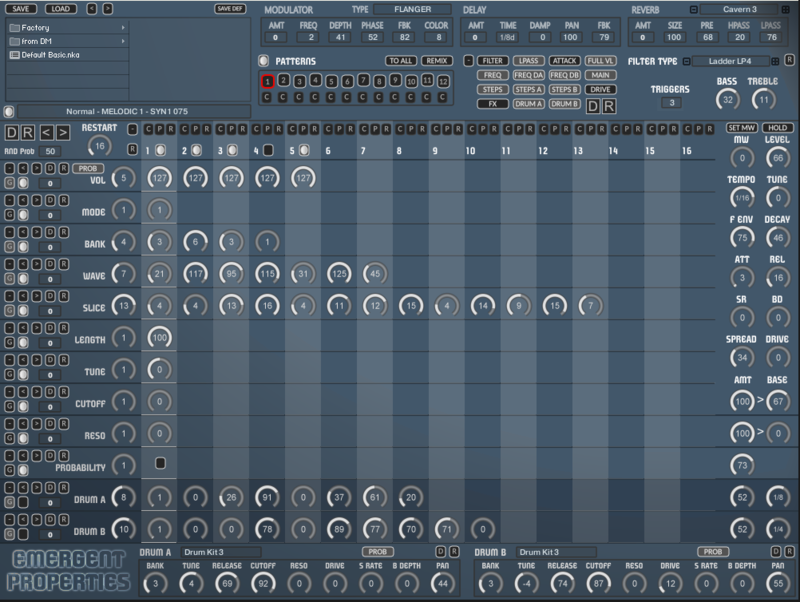 The main Sequencer is designed around complex Wave Sequencing using a large collection of over 1000 Morphing Samples which evolve through different sounds. Each sequencer has it's own Step length and the Bank, Wave and Slice sequencers add up to determine which Sample will be played. Additionally there are 30 Different Modes selected via the Mode sequencer lane, which can radically change the sound such as LFO Chopping, Reverse, Phasing and Talk type Modulation effects. There are also 2 Dedicated drum Modules available with dedicated Sequences, each of which have their own Tempo Clock Division. There is a total of 635 Drum Sounds which are divided into 9 Banks. The first 5 are Kits where 1-50 are Bass drums, 51-80 are hi-hats and the remaining 48 are Snares which are followed by Dedicated Bass drum, Snare and Hi-hat Banks. There are 12 patterns in total which can be switched/automated via the GUI buttons or by using the dedicated octave of triggers (which are shown in red on the Kontakt MIDI Keyboard Display). The Octave position of these triggers can be changed using the 'Triggers' setting. Every Knob and value in the lower pattern area including the Drum Modules are distinct for each pattern (with the exception of the Random Probability Factor). The editing system is sophisticated for example using ALT/OPTION whilst clicking/editing a knob will change the value in all patterns, or in the case of the actual Sequencer knobs it will set the entire Row to that value. There is also the ability to copy any row to all other Patterns or a specific one. There is a dedicated button for copying the current pattern to All other Patterns which is a good way to start with a common base. Additionally there is a Remix button which will remix all sequences into a different order in each pattern instantly creating a series of variations. 'Remix 2' goes a bit further by also randomizing other parameters to create more Diverse results. There is a sophisticated Randomization System throughout, with Row randomizers, the current pattern Randomizer as well as a Global Randomizer which will Randomize the entire machine. There are plenty of options to decide what the randomizers will affect and also the ability to decide which individual banks and Modes should be available as valid choices.